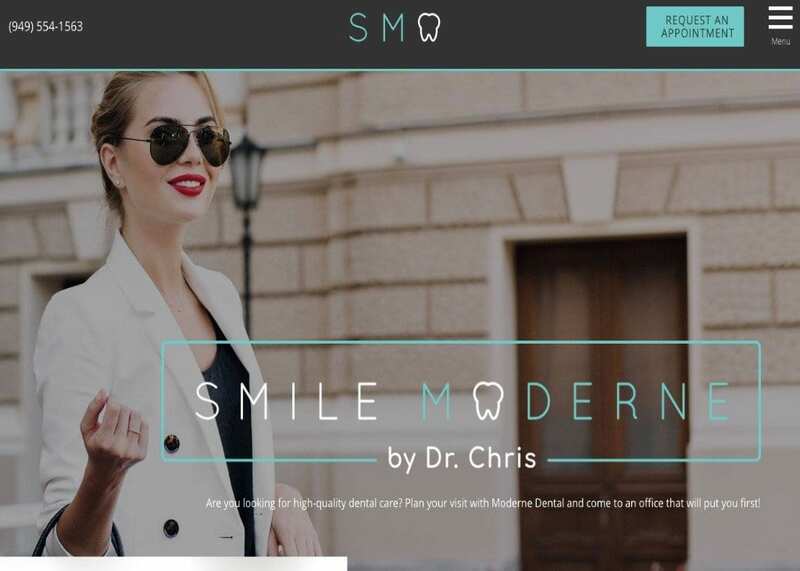 The website for Smile Moderne was designed to approach a high-tech and hip society that’s always on the move. Positioned in south Orange County, California, it’s necessary for it to present a cutting-edge appearance to those who visit; no one wants to be seen patronizing any business that isn’t current and up to date. This website is targeting a community where style and appearance are important. This dental web design carries a minimalist, modern and high-tech design with an open and friendly atmosphere. While remaining believable, it strongly has notes of the dental office of the future. This doesn’t make it standoffish though, in fact, quite the opposite. The suggestion of a clean open facility combines with the prominent image of Dr. Chris to inform the visitor that this is a high tech facility with an open and friendly staff, and they’re excited to use the latest tools to bring you the brightest smile. This website has a slick and modern look using light blues and sparkling whites, two colors that together send a few messages that can be important to a dental patient. White is the color of purity and professionalism, but also has some undertones of ‘high tech’ thanks to the association with laboratories. The light blue sends a subtle feeling of comfort and compassion but also boosts that high-tech feel with a slick and futuristic integration with the white tones. This site suggests that the facility it represents is dedicated to the latest tech in the practice of dentistry. This design isn’t just young; it’s slightly forward-looking, even futuristic in its design. While all of the elements involved are common in website design, it’s their implementation and presentation that keeps things slick and moving on this site. From a human perspective, it’s clear that this practitioner wants to welcome you to his site and get to know you so that the two of you can design a plan for your oral health together. Representing a facility in the Orange County area, this site design knows its likely clientele. Slick, futuristic, and on the move, the whole layout of this site is youthful and up to date. Clients who come to see Dr. Chris are on the move, and time is of the essence, why else put the social media links prominently at the top of the page and immediately present them with the number and link to schedule an appointment. Life is on the move for this facility, and this design tells visitors that they’re not just keeping up, they’re ahead of the game. Youth, ambition, beauty, and speed. Everything about this site brings these four elements together in a high-tech and avant-garde presentation. From the first moment, a visitor is on this website they’re shown slick efficiency with immediate access to making an appointment and information about the practitioner. For a website that’s serving a modern and youthful community, this is the perfect design choice and execution.